In this interview, Riley Humler talks about collecting Rookwood art pottery, and discusses the history of Rookwood and its artists and products. Based in Cincinnati, Humler is Gallery Director of Cincinnati Art Galleries, which holds two Rookwood auctions each year. He also appears as an appraiser on Antiques Roadshow. I don’t remember the first Rookwood piece I ever bought, that’s getting close to 40 years ago. But I must have liked it, because I kept studying and learning, and it’s been a lot of fun and a lifelong thing. I’m originally from Kentucky, about 90 miles down the Ohio River from Cincinnati, where Rookwood was based. So there was Rookwood in the area, and I could also drive up here to look for things. I’m not as aggressive a collector as I used to be, but I still enjoy it. And we auction about 400 to 500 pieces of Rookwood here twice a year, so I get to play with all that, which is almost as good as owning it yourself. We see amazing Rookwood pieces here. The most valuable one went through about four years ago, and sold for $350,000. It was a very rare combination of hand glaze and electro-plated metal, done by the Japanese artist Kataro Shirayamadani. An amazing piece… it was a record for any American art pottery. In 1991 we were fortunate enough to buy probably the largest collection of Rookwood ever assembled called the Glover Collection, which we dispersed in an auction setting, thinking we would do that auction and then get out of the auction business. But then we were encouraged to sell other Rookwood collections, and we’ve been doing it since 1991 and have a great time at it. Collectors Weekly: Can you give us a little background on Rookwood? Humler: Rookwood started here in Cincinnati in 1880 and operated until about 1960. By then the company was pretty much defunct, was sold and moved to Mississippi, briefly stayed alive and then shut down again. The copyright was sold to a dentist in Michigan who operated the pottery making small animal figurines and things. He owned the copyright, and did that for almost 20 years. Recently a group of businessmen here at Cincinnati bought the copyright from him and they’re trying to put Rookwood back on the map. So although Rookwood wasn’t in continuous production from 1880, the copyright has always been enforced. Rookwood’s success came from a couple of things. They were very conscientious about always trying to continuously improve their product, quality was always on their mind. They wanted to be profitable, but they also wanted to do things the right way. They also had a constant supply of well trained artists working at Rookwood because of their proximity with the Cincinnati Art Museum and the training facilities at the museum’s art academy. Finally, they also had a general manager, William Watts Taylor, who was very, very sharp and interested in promoting the product internationally, and he did a great job of doing that. Rookwood was founded by Maria Longworth Nichols, who happened to be very wealthy and was interested in producing art pottery. Through her urging, the pottery began and continued to improve for four or five years, but she became less interested in the operations and actually gave her interest in it to others to continue. Taylor really is the guy who put Rookwood on the map. International competition was important, like the St. Louis World’s Fair, the Paris Exposition in 1900, the World’s Fair in Buffalo. Anytime there was a major international exhibition where pottery was judged, Taylor was quick to make sure Rookwood was there, and they won a lot of gold medals. They actually sold a lot of product in Europe. Collectors Weekly: Was all Rookwood pottery handmade by individual artists? Humler: Most of it. There are really two kinds of Rookwood. The artist-decorated pieces, each of which is relatively unique, although artists would do similar kinds of things. And then they made what they’d call production pieces, which were simple forms with generally a single color that could be made in quantity and sold at a more reasonable price. That started around 1900. But their main stock in trade and the thing that made them famous were the artist-decorated pieces. In terms of style, Rookwood is often associated with the Arts and Crafts period, but you have to analyze what that term means. 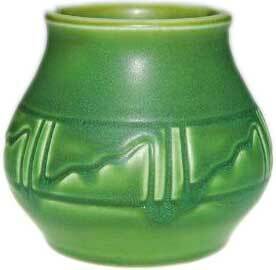 Some people see any green pottery made from 1900 to 1912 as Arts and Crafts. 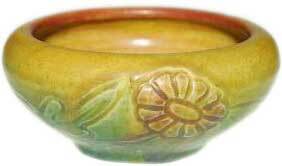 There’s that school of thought that Arts and Crafts is just a very narrow area of strictly matte glaze stuff made for the 15 years of the 20th century. In my view, Arts and Crafts denotes more of the handmade aspect or the uniqueness of the work, and there are still Arts and Crafts things being made today. Rookwood pieces have a uniqueness based on being handmade. It’s not a widget that they made 10,000 of them in a day. At any given time, Rookwood had about 20 or 25 artists working doing the decorating, fewer in the earlier days. Their heyday was from the 1890s through about 1930. There was also a division of labor within the company. You’d have people who’d throw the pots, people who’d fire the pots or do glazing, and then the decorators. The purist Arts and Crafts sentiment would be that one person would do all of that and be gratified by his efforts and uplifted in having done all this himself. But Rookwood did divide that labor, which is a good or a bad thing depending on your feelings about Arts and Crafts. Collectors Weekly: Who were some of Rookwood’s most notable artists? Humler: Kataro Shirayamadani would be at the top of anybody’s list. He was a consummate craftsman who could do just about anything, and he did some amazing work. Albert Valentine, who ended up in California about 1907, was a great artist, particularly wonderful when it comes to flowers. Sara Sax, who worked at Rookwood for a long time, really didn’t come into her own until after World War I and started to produce some very beautiful modern things. Jens Jensen, a Scandinavian immigrant, did some fantastic Picasso-esque pieces in his lifetime. There are a number of very significant people who worked at Rookwood and produced a consistently good body of work. There were some connecting themes. 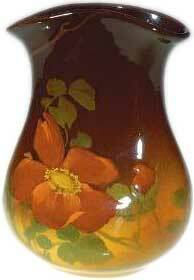 Rookwood certainly did a lot of flowers on their vases, for example. But the more interesting artists had a unique style and their works stand out. They’re instantly recognizable, whereas a lot of younger artists copied each other. If you go back to the 1880s, there weren’t any books on how to make art pottery. It was a new and emerging idea, and many people attempted to produce a similar look and managed to do so using different techniques. They had to invent as they went. A lot of the technical stuff had to be evolved by trial and error. Rookwood tended to be ahead of the pack in terms of innovation and more aware of what was going on internationally. 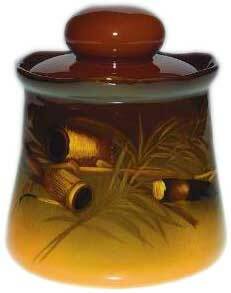 There were a lot of people who played off Rookwood and produced a very similar product. Weller, Owens, Roseville – a lot of Ohio companies made similar products, not as good for the most part, though they each made products that were interesting in their own right. In other parts of the country, Grueby in the Boston area did some remarkable matte glaze pieces and beautiful designs for tile installations. Newcomb College in New Orleans produced some great pottery in a style very much in keeping with the flora and fauna of the south. Everybody who did art pottery in this period was trying to come up with a better mousetrap, and in many cases they did. Collectors Weekly: What were the main forms that were in demand at that time? Humler: Rookwood certainly made a lot of vase forms, but they also got into the architectural business, which got very big around 1900. People realized you could do a lot with tile in terms of interior and exterior space. Being a very plastic form, you can make tile to fit just about any area and it’s relatively simple to do. So Rookwood got into the architectural tile business as did others. Grueby made some fabulous tile for interior use. Tile was a big part of Rookwood’s output, though not a very profitable one. Rookwood also applied the same techniques they’d use on a vase to decorating on a flat surface that could be framed and hung on the wall. Unlike the architectural stuff which would be cemented in place, this was a framed rectangular square painting made out of clay and decorated, that you could add to your art collection. They also made plaques. And a lot of utilitarian objects. 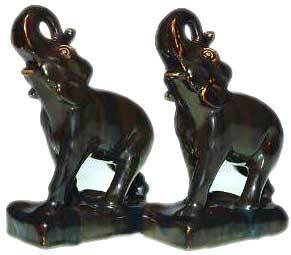 Of particular interest to collectors these days are Rookwood bookends and paperweights. They made a lot of fun bookends and paperweights and figural pieces, which are not always as expensive as some of the vases. But they can get into the low thousands. Collectors Weekly: How did Rookwood bring all this stuff to market? Humler: They had a showroom at the factory, but they also had connections with department stores throughout the United States. Certainly Marshall Fields in New York and Chicago, probably Gump’s in San Francisco, those types of names. Rookwood was sold in fine department stores and jewelry stores throughout the United States, which is how it got dispersed all over the United States. They did a mail-order catalog once, but I don’t think it was very successful. Like a lot of companies, Rookwood went into hiding during the Depression, into seclusion, just dropped off the map from the collector point of view. I don’t think anybody collected much of anything until well after World War II. In the early 1960s, there were people collecting Rookwood who weren’t even necessarily aware what they were doing. They might have known that it was made in Cincinnati and that it was pretty neat, but they didn’t have a lot to go on. By the early 1970s, there were new collector books in a lot of areas that spurred interest, and then museums got involved and held major showings of things that had fallen out of favor, like Rookwood and Tiffany. That’s when it really kicked into gear. By the late ‘70s, prices had gone up dramatically, and since then have cycled up and down and up down, depending on the economy. When I say fallen out of favor, I mean that nobody had any money from, say, 1930 to 1945. After World War II, people were coming back, wanting to get married, set up household, buy a house. But nobody had tons of money, they bought mass-produced stuff at Sears Roebuck. Nobody was making the kind of stuff that had been made prior to the Depression. But by the 1960s, people started recognizing that there were some products that maybe their parents or grandparents had stored in an attic that were of interest and getting them out and saying, hey, this is really well made. It’s really pretty. Where can I get some more of this? It started in a grassroots manner. Collectors Weekly: How many handmade Rookwood pieces do you think were made, and how many survived? Humler: I’d suspect maybe in the neighborhood of a hundred thousand. And I would think probably the vast majority of them have survived. Nobody will ever know exactly but we see new stuff on a fairly regular basis. New to the collecting world. It just comes out of somebody’s closet or basement. You never know. Probably 99.9 percent of Rookwood pieces are very clearly marked. Maybe one in a boxcar load will be deceptive and not have any marks on it. On eBay all the time, you see “unmarked Rookwood,” and that’s just bogus. Early on, the mark would say Rookwood, then from the mid 1880s on, it would have the Rookwood logo, a backward R and a P placed one next to the other, and variations of that along with the artist’s initials and the date. There was a dating system, with shaped numbers. There were indicators of different types of glazes. Rookwood had a very good system that’s fairly easy to understand. If you have one book on Rookwood, you get a pretty good sense of how the marks work, and you can figure out who did it, when, and what it might be called. Collectors Weekly: Who collects Rookwood today and what are they collecting? Humler: There’s some people with eclectic collections who look at a lot of different things. And others who are very specific about what they collect, they might just collect a particular type of Weller or Roseville or Rookwood or a particular artist or period. We’re all susceptible to the disease and have different manifestations of it. I’ve personally had a longtime interest in things Rookwood made from about 1915 and 1930, which is not mainstream Rookwood, but they’re things I like. A lot of new looks and new glazes were in vogue then. Some of the artists were really doing some innovative stuff. I would say it’s a modern look as opposed to Victorian or Art Nouveau or Art Deco or Arts and Crafts (all of which Rookwood did in response to market demand). It would be more of a modern flavor. There really isn’t a definitive name for it. Collectors Weekly: Are there substantial Rookwood collections out there in museums, and has that influenced the market at all? Humler: Museums have always been interested in Rookwood because it was a first-class product, and there certainly were collections put together, some of which were dispersed. Now that Rookwood is very much back in the public eye, museums that have acquired pieces to augment their collections. The Philadelphia Museum of Art has a fabulous collection of Rookwood as does the Cincinnati Art Museum. Most any museum in the United States has a piece or two. The whole concept of art pottery is well represented in most museums, and each region usually has a favorite son that will get more display. Interest in Rookwood is primarily a U.S. phenomenon. There’s a lot of great European art pottery, and from around the world. Rookwood is mostly collected by Americans. Despite the fact that in the early 1900s, a lot of Rookwood was sold at international exhibitions and can be found in other countries. 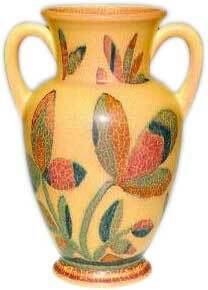 There are a lot of really fine European art potteries that tend to have more universal appeal. Like Royal Doulton from England, Boch Freres from Belgium. There are tons of interesting French and German art potteries. Collectors Weekly: Any advice for somebody who’s thinking about collecting Rookwood? Humler: There are lots of good books. My philosophy has always been if you’re going to collect anything, be a serious collector and learn as much as you can. So if you’re in a situation where you need to make a decision, you know what to do. If you can immerse yourself in it, it’s a fun hobby and a safe hobby and you can actually learn, and knowledge is power. There are people who say I long for the good, old days. Well, the good old days are right now. They’re not going to get any better, and there’s bargains to be had out there right now but you have to know what you’re doing. I think a lot of people are nervous about where things are in terms of the economy. If you bought something within the last five years, you’re probably going to take a hit if you plan to sell. If you bought 20 years ago or you bought wisely 10 years ago, then if you sell now, you’re probably okay. If you bought wanting to flip very quickly, then it’s maybe not a good time to do it. But that’s life. In our auctions, we have Rookwood pieces priced all over the place. There’s a lot of Rookwood that can be bought for under a thousand dollars. But if you’re going to buy in the 500-dollar range, buy good 500-dollar pieces, and if you’re going to buy in the 5,000-dollar range, buy good 5,000-dollar pieces. That’s where becoming an informed collector is important. Rookwood was such a good product and such an expensive product to produce that there’s very little in the way of reproductions. When it does occur, it’s usually in the production pieces, the cheaper things, we see a few of those every year. Usually one person decides they’re going to make some fake Rookwood and sell it, but generally the people who collect know it when they see it. Some of it shows up on eBay but it’s rare. The bigger issue with eBay is sellers who either don’t know or don’t care to know what they’re putting out there, and sell stuff that isn’t as described. Collectors Weekly: In addition to your gallery, you also do the Antiques Roadshow, right? If you look on the Antiques Roadshow website, you can pull up all the individual appraisers and see video clips of the last two or three years worth of stuff. If you really, really are bored, you can see a few things I’ve done over the years! Collectors Weekly: Thanks so much for your time, Riley. We really appreciate it. Recently purchased a lovely art pottery vase with a stylized R on bottom. Can you tell me anything about it ? Happy to send a picture if I had your email. Thanks for any help you might supply. They are art deco style of shapes & color. one is #1044 & one is #1043. they are like 11 1/2 in tall and a bulbous style vase with geometrical shapes of different colors. there is like a $300 difference in price. I collect Roseville, Hull, Bitossi, Ephraim, and 2 rookwood pieces and know these pieces well. My mother collected pottery, so I started young! I know Nothing of these pieces & can’t find the information on these exact pieces that I wwas looking for. Any help? How to tell if their copies or not, their value, links for research that don’t send me in circles, I would appreciate ANY help. I like the look of these pieces but would like to know more Thank you for your time! I have a slim light brownish vase (aqua blue inside) with rather four abstract figures on it–tall animals? “R” on bottom. 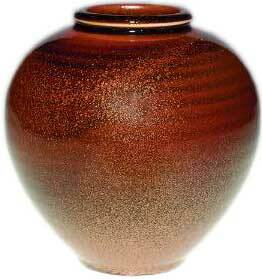 Vase is round. My parents were born in 1924 in Cinnanatti so this is clearly one of their parents’. Was this commonly done back then? Does it have value? Sure wish I could read the name better.